Two king bedroom, two bath with whirlpool, fully furnished kitchen / living area with plasma TV and fireplace. 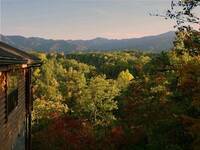 Secluded hot tub deck with awesome views, charcoal grill, log picnic table, rockers and swing. Charming county creek side cottage, features two bedrooms, 1 king, 1 queen, sleep sofa, two baths, Jacuzzi, internet, pool table, foosball, and hot tub. 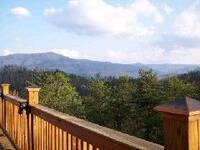 Cozy and charming log cabin features two king bedroom, 2.5 bath, game room with pool table, wrap around deck with located minutes from the Glades Arts and Crafts community in Gatlinburg. 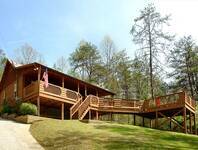 Bear Necessites Cabin Rental features privacy and seclusion with a beautiful mountain view, queen bed, fully furnished kitchen, jacuzzi, seperate bath with shower. 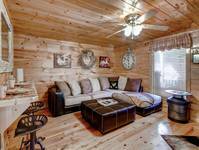 Private and secluded log cabin in Pigeon Forge with 2 King bedrooms, 2 full baths with Jacuzzi, living area with gas fireplace, game room with pool table, fireplace, bunk beds ( queen/ twin), fully furnished kitchen, covered porches, rocking chairs, charcoal grill. Step inside this uniquely decorated red barn and find a fully furnished kitchen, full bath with shower living area with sectional, flat screen tv with blu ray, upstairs is a king sleigh bed, full bath with jacuzzi. The wrap around deck features gas grill, rockers and hot tub. Soar above the tree tops On Eagles Wings, charming and cozy one King bedroom, sleep sofa and futon, perfect for a couple with small children. Features fully furnished kitchen, spacious living room with wood burning fireplace, 2 bath with Jacuzzi, wrap around deck with mountain top view and hot tub. Charming and Cozy one bedroom features open living / dining room, gas fireplace, full kitchen, King loft bedroom, heart-shaped Jacuzzi, half bath, table top arcade game. 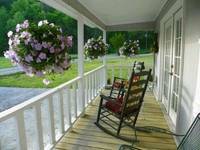 Romantic Honeymoon cabin with king round bed, heart shaped Jacuzzi, electric fireplace, full kitchen, and hot tub, located minutes from Dollywood and Pigeon Forge.